This coloured lithograph is taken from plate 18a of Sir Charles D'Oyly's 'Views of Calcutta and its environs'. The plate is composed of two separate images. 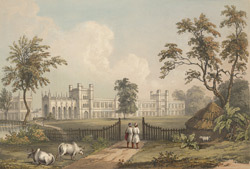 This one shows Bishop's College, which was established in the early 1820s by the first Bishop of Calcutta, Thomas Middleton, as part of a scheme for a theological college along the lines of that at Cambridge. It contained a chapel, houses, library and lecture rooms. It later became the Calcutta Engineering College.